This pitch "throws power hitters off balance and is easy to keep below the knees." It's been the go-to pitch "for a number of great pitchers, from Trevor Hoffman to Jamie Moyer to James Shields." What pitch are they talking about? The changeup. 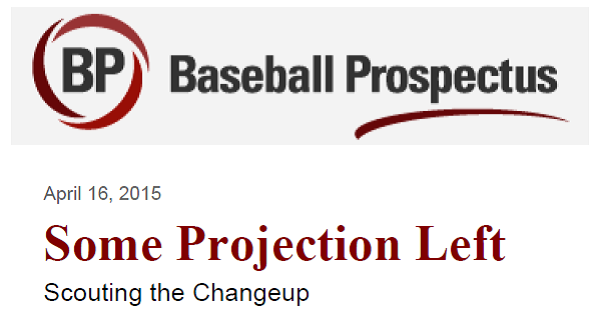 I've written about the changeup 3 previous times, in 2012, 2013, and 2014. "The beauty of the changeup is its simplicity. Its a beautiful thing to watch when you are aware of what a good one looks like." I've found only 1 grip that gives the deception that's needed for a great Changeup. To learn that grip, you can subscribe to my Baseball Video Library and watch a video presentation on The Changeup.